This modern and bright 3.5 room apartment with 2 bedrooms (1 x double bed king size / 1 x double bed queen size and 1 x single bed) for 4-5 people is located on the first floor and welcomes you with a living area of 86m2. The renovated kitchen is well equipped (dishwasher, coffee machine, raclette grill) and the dining/living area is cozy and spacious. Radio/satellite-TV and free internet (WiFi) is at your disposal as well as a bathroom with bath/shower/toilet and a separate storage room. The large balcony offers amazing views of the mountains. The Eiger seems within reach. Free covered parking in front of the Chalet. The railway station and village center can be reached within 5-7 minutes walking distance and the next bus stop is located nearby. 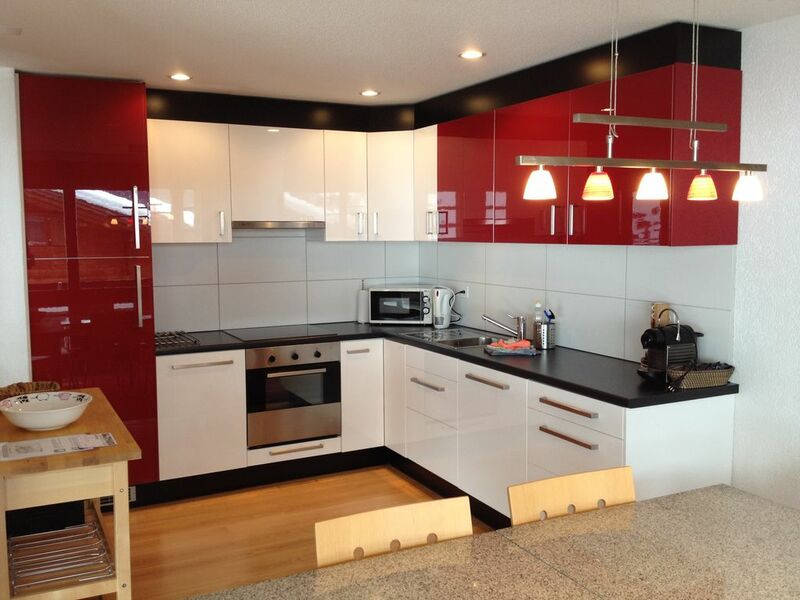 The apartment 'Shreckhorn' is ideally located for skiing and hiking holidays. Set in the world famous Bernese Oberland, Grindelwald is the base for some of Europe's best walking trails and has become something of a hiking Mecca over the years. During the winter months with over 260 kms of slopes in the Jungfrau region you are spoilt for choice. The chalet is perfectly located in a very quiet private road just a 5-7 minutes walk from the railway station (Grindelwald Dorf) and the village center. The apartment Shreckhorn with 86 m2 living area for (4-5 persons) and 3.5 rooms (2 bedrooms) is located on the first floor. Both are very spacious. Each one has a very large south facing balcony (apartment Shreckhorn) or large terrace (studio Pilatus) with uninterrupted views of the Eiger North Face and the surrounding mountain world. Both have modern furniture with a fully equipped modern and brand new kitchen, internet (WiFi), cable LCD TV and a covered parking space (carport) in front of the chalet. Cleaning at the end of your stay, linen, towels, kitchen towels, Internet and the carport - everything is included in the rates. The only additional costs are the tourist taxes (from 2018 per night : CHF 4.70 per adult and CHF 3.70 for teenies). Very wide and sunny balcony/terrace overlooking the ski area 'Kleine Scheidegg & Männlichen' and an incredible view to the Eiger North Face. The apartment and the studio are very bright (window front) and spacious. Very good location. Close to the ski bus stop (100 m) to all skiing and hiking areas: Firstbahn, Männlichenbahn or Grund railway station for the train to Kleine Scheidegg (Top of Europe). 5-7 minutes walk to the railway station or the center of Grindelwald for shopping, dining or relaxing in one of the beautiful Restaurants and Bars. We really enjoyed staying at Shreckhorn, it was perfect for our 5 nights stay in Grindelwald with our 3 children. The view from the balcony was amazing and we sat for hours in the evening working out different routes up the mountains in view. The apartment itself was extremely well equipped and spotlessly clean. It had everything you could possibly need and felt like home. Our 3 boys we desperate to stay longer! We would highly recommend to friends and family and hope to be back. My wife and I and our two kids (ages 5 and 8) stayed in Apartment Schreckhorn and could not have enjoyed it more. The property is in a perfect location, out of the craziness of “downtown” Grindelwald but only a few minutes walk away. We were also able to easily walk to all of the main lifts — First, Mannlichen and Phingstegg. It is extremely well appointed, having everything we needed including a ton of stuff for kids. The internet worked great and the views from the balcony were amazing — we sat out there many a morning and night just relaxing among the peaks. Christine, the owner, was great - even stopping by once to check on us and drop off a box of sweets. All in all one of our best spots on our two-month trip and definitely a place we would return to. thank you so much for telling us, that you enjoyed your stay. It is always our aim that our guests feel like beeing at home. We really would appreciate to welcome you once again in Grindelwald at the Schreckhorn apartment. Large and bright contemporary styled apartment that has been nicely refurbished with all new furniture and appliances. It has a good sized balcony with outstanding views and plenty of space for eating and sitting outside. Wi-fi is good and easy to connect to and the satellite tv gives a good clear image. Refreshingly it comes well stocked with every non perishable you could possibly want from coffee pods to washing up liquid, so don’t bother taking any. The apartment seems to be 1 of 8 holiday units in a purpose built block and is quietly located (we slept with the windows open). It is well positioned being only a few minutes walk from the: town, train and bus stations, and excellent supermarkets. We found that the foam mattress in the main bedroom gave poor lumbar support and reflected almost all body heat. After 3 nights of poor sleep and stiff backs we switched rooms were the other mattress was fine. The satellite tv seemed to have no entertainment channels in english and there was no dvd/blu-ray player as an alternative. If you’ve checked it out on a satellite image (as we did) you will know that there is another building, directly in front of this block, but at only 3 stories we found it did not deter from the view. However, it seemed occupied and as their top floor is at the same level as the apartment, and provides a direct view throughout, we felt this did impact on privacy. If you are arriving from the station the apartment is reached by a short but very, very, steep downhill path which is problematic with heavy wheeled luggage. This path then joins a narrow road with a single curb less pedestrian pathway. There is not sufficient room for two vehicles to pass without using the path and no room for pedestrians when they do. In the UK this road would be designated one-way and we never did get used to this rather bizarre ‘accident waiting to happen’. We do really appreciate your review. We are happy that you enjoyed your stay in our apartment. Thank you very much for your honest comments. However we would like to explain the concerns you mentioned: Most guests praise the very good quality of sleep in these beds. We are very sorry if you had sleeping problems, may be because of the other, quiet environment? The mattresses on the double bed in the main bedroom are new and of best quality with two different hardness levels (Bico). The mattresses in the second bedroom are not brand new, but of good quality. So far no guests have complained about the beds. As you booked only for 2 people, you had the possibility to choose between the different beds. As you mentioned, the SAT-TV is of a very good quality. We think that this electronic entertainment should be enough during holidays. The apartment is located near the village center and it is inevitable that there are other chalets around. All rooms have curtains that you can close for the privacy. The view and peace is absolutely not impaired. The streets are not very wide in mountain villages. We always use them and never had the feeling of being run over. You had not have to walk on the ‘very steep’ path to reach the apartment if you would have followed the road or you could have taken the bus (one station). By your own mistake, you have paid the tourist tax twice. We have fully refunded the amount. For your arrival we provided sweets. And you asked us for a later check-out on your departure day, which we have granted to you. We wouldn't have to provide these services. We are a little bit disappointed that you do not mention these positive things. Fantastic amenities. Everything you could wish for. Great views. Quick walk into Grindelwald. Would definitely stay here again. Extremely equipped comfortable cozy apartment with great view on the Eiger and surroundings. Very close to village for shopping and restaurants. Skibus only 2min walk and 5min later in cable car or train to slopes. We have certainly enjoyed our stay and would love to go back. Grindelwald: Eiger North Face, Jungfrau, Top of Europe with incredible glacier view, Wengen, Mürren, Lauterbrunnen with Staubbach falls, Schilthorn, Faulhorn. Close to Grindelwald are the small cities: Thun, Interlaken and Brienz. Interlaken is located between 2 lakes (Lake of Thun + Lake of Brienz), Boat trips are possible on both lakes. Close to Interlaken are the famous Beatus caves. Close to Brienz you can visit the Ballenberg museum.